Ever since Robert Louis Stevenson first penned “The Strange Case of Dr. Jekyll and Mr. Hyde” its particular examination of the nature of good and evil, and the balance of these qualities in the ordinary person, have proved fascinating. Though many today are not as familiar with Stevenson’s complex novella as they are with the more than 123 films based on it, the term “Jekyll and Hyde” has entered the English language, as a way to refer to someone with vastly different behaviors under different circumstances. 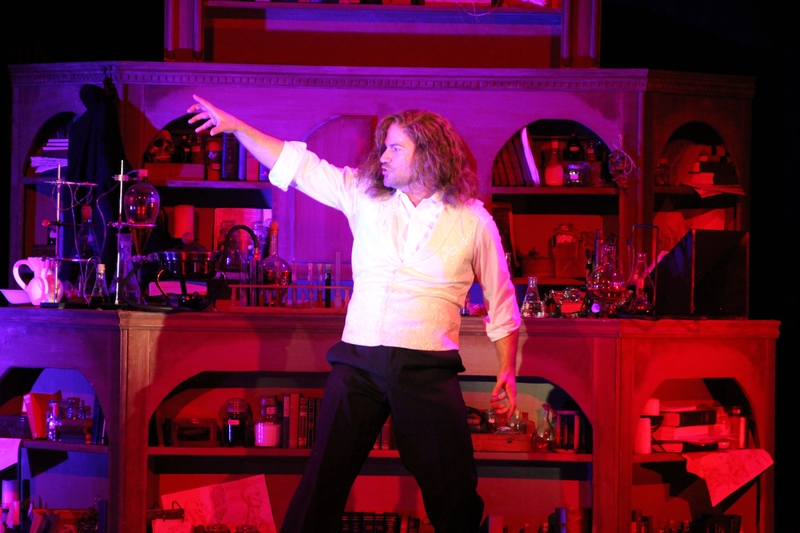 The stage has not been immune to this fascination either, and in one of the more recent dramatizations, the musical “Jekyll and Hyde” made it to Broadway in the late 90s and stayed there for nearly 4 years. Like many of its counterparts on Broadway at the time, this version by Leslie Bricusse and Frank Wildhorn is operatic in style. Its focus stays mainly on the well-meaning Dr. Henry Jekyll, his experiments to remove evil from mankind, and the creation of the totally evil Edward Hyde – whose strength of personality gradually consumes the gentler but thus weaker Jekyll. Now at the Candlelight Pavilion Dinner Theater, this musical version is not without its issues. Though the production is tight and well performed, the music and lyrics sometimes leave a bit to be desired. Still, the essence of the story survives, there are some strong characters. The show’s hit song, “This is the Moment,” which proves so pivotal, remains as powerful as ever. Much of the production’s success comes thanks to a strong, vocally impressive cast and a particularly elaborate setting for this small theater. Michael Scott Harris virtually carries this piece, as Jekyll/Hyde. The transformations he makes from carefully appropriate doctor to vengeful wanton are brilliant – changes of voice, of carriage and articulation which take the audience along seamlessly as he shifts back and forth. In this he is well supported by Amy Gillette as Jekyll’s understanding, upper crust fiancé, and Laura Dickinson’s warm-hearted, easily abused prostitute, each of whom holds their versions of this one man in their hearts and passions. The singing in all these cases, honed to fit the characters, proves rich and sophisticated, leading the story along. Also worthy of note are Richard Bermudez as Jekyll’s lawyer and longtime friend – the man who pushes hard to figure out what is going on, and Bob Bell as Jekyll’s future father-in-law, loving but deeply concerned. Beyond this a large and versatile cast play everything from street urchins to bishops with fervor and intelligence. Director Jason James uses the complex stage well, and just about the only thing one could wish for is that some of the set pieces would not make quite so much noise, rolling in behind active scenes. Janet Renslow recreates the choreography from the original with style – often as much movement as it is dancing, and by and large the thing looks and feels as edgy and mysterious as it should. In short, for someone looking for a different way to feel spooky around the Halloween period, this is a fun one to see. Note: this story is essentially an adult one. A number of characters are prostitutes plying their wares, and the changes in Jekyll, which are often quite vivid, might be disturbing to younger children. Although there may be a dish on the dinner menu for children, I would think twice about bringing them below a more sophisticated age. 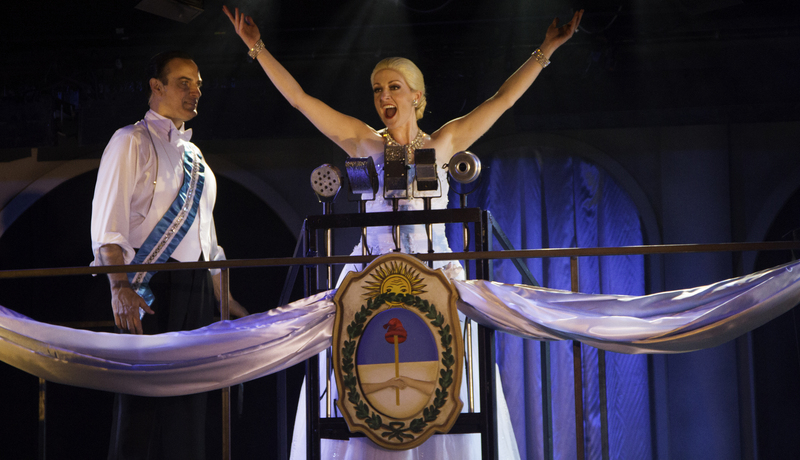 The airwaves have recently been full of offerings celebrating aspects of the American musical theater. 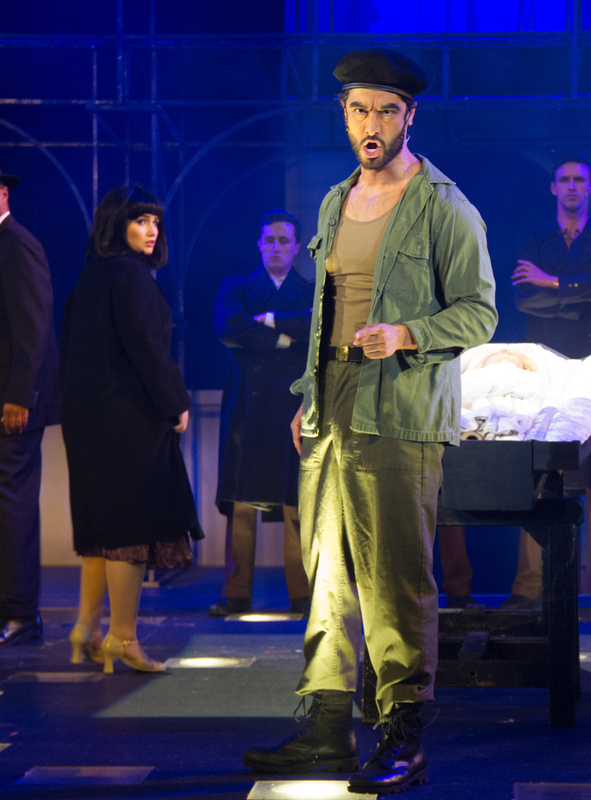 More than once, it has been pointed out that many, if not most of the musicals since the end of World War II have had a lot to do with clashing cultures, or with those outside the cultural norm. Certainly, Richard Rodgers and Oscar Hammerstein’s “The King and I” falls into that category, basing a lushly told story on the edgy balance between east and west. Now, at Candlelight Pavilion in Claremont, a new production of this much-loved classic has a lot to recommend it. The songs prove cheerful and remarkably timeless. The dancing – absolutely requisite to the plot line at one point – proves up to the demands. The children are cute and the adult performers handle their very individual characters with aplomb. Of course, the story is now imprinted on a theater-lover’s DNA: In the 1860s, a British widow becomes tutor to the children of the King of Siam, enriching both their lives and futures. The actual king (Rama IV) actually did bring in a British woman to work with him in creating an aura of western civilization strong enough for him, and the son who followed him, to fend off western imperial attempts at co-opting his country. It worked. Of course, Rama was neither as backward or as “other” as this musical makes out, but the point about westernization and the innate wisdom of a non-western king is still made. Clynell Jackson III makes a stridingly commanding king, even managing to keep up the patter songs like “A Puzzlement” when dealing with a recorded orchestra – a singularly difficult task. His chemistry with Jenny Moon Shaw’s Mrs. Anna kind of comes and goes, but there is enough present for “Shall We Dance” and the show’s powerful ending to work. Shaw sings well, and exudes warmth. Indeed, the only detriment to her performance appears to be costume-related, as it takes her some time to walk naturally in a hoop skirt without gripping it in a very un-1860s kind of way. Again, however, her energy and her voice carry the piece as it should. Also worthy of significant notice is Angela Briones’ Tuptim, whose bell-like singing sets the tone of innocence for the much-abused Burmese princess. 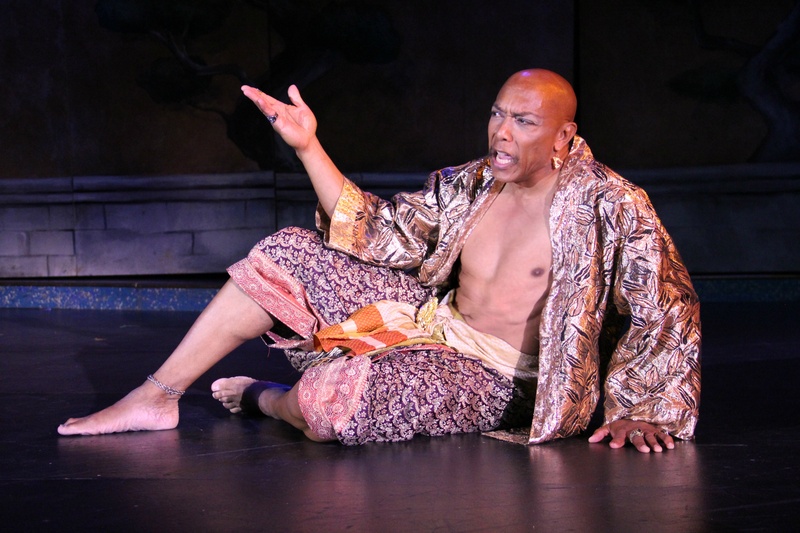 Richard Bermudez makes a muscular and commanding Lun Tha – Tuptim’s clandestine lover. Stella Kim handles one of Rodgers and Hammerstein’s most touchingly grown-up love songs, “Something Wonderful,” and carries an innate nobility which underscores her role as first wife. The kids are cute and willing. The staging of their entrance has been handled well by director Neil Dale, matching children to “mothers” who can guarantee placement. Jason Luke Hill makes a very likable Prince Chulalongkorn – innocent yet assured of his standing. Likewise, Wyatt Larrabee makes attractive work of Anna’s own son. The rest of the children alternate between two casts, but the ones I saw did a fine job. 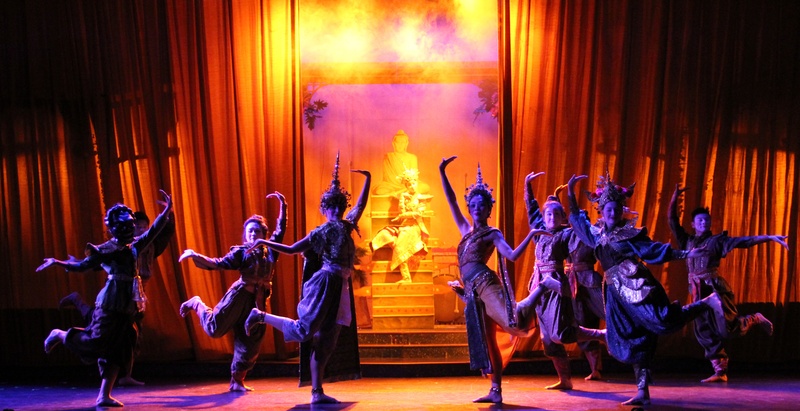 Perhaps the acid test of any “King and I” is the dance/story-telling rendition of “The Small House of Uncle Thomas.” Simeon Den’s choreography offers just enough traditional Thai movement to make it work, and his uncredited “Eliza” does a particularly nice job. Perhaps most importantly, the thing looks right. Neil Dale has created the difference in movement which helps define differing cultures, and keeps it consistent. Chuck Ketter’s lush-looking set allows for quick changes and Dale’s direction keeps the pace hopping. The result is colorful, tuneful, and brisk. Indeed, the only thing in the show which might benefit from a bit of a slower tempo is the very end, where everything seems to happen on top of itself a bit. For some folk it may be difficult to get beyond Yul Brenner and what he brought to the show from its very first days, through to the film and tour after tour during his lifetime. Still, sometimes something older can only become new again when one moves past a single performance to look at the show itself. This one is worth it, from a musical and a message standpoint. Give it a try. Help support Southern California’s last dinner theater. Take the kids, too. It’s a great chance to have a nice meal, see other kids onstage, and a history lesson (well, sort of) to boot.